My friends occasionally ask how much the natural/local/organic lifestyle costs. My answer: You’re not going to save money. Though there are tremendous health benefits to changing your diet, getting past the almighty dollar is still hard. It’s easy to love the idea of buying that locally-produced granola, but it’s not so easy to justify the $9 price tag. Local food will almost always cost more than food produced on an economy of scale and shipped in from distance. In some cases, prices will be about equal. There is, however, one notable exception. You will usually save money on in-season foods bought at a farmer’s market. How do you know what’s in season? It’s whatever is at the market. Indeed, corn is wicked cheap right now. So are blueberries (though blueberry fields will be shutting down shortly). Cucumbers and zucchini are practically free. 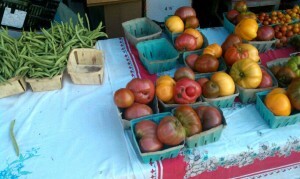 There is one more option to buying local and saving money: Pick the produce yourself. For a few dollars, an hour or two, and some fuel, you can come home with lots of inexpensive, local, and in-season produce. PickYourOwn.org has a well-maintained list of pick-your-own farms around the United States. We’ve been trained by years of artificially-deflated food prices to think that $4 for a dozen eggs or gallon of milk is expensive. It’s not. The prices of local food tend to be exactly what we should be paying for them. From there, finding a good deal is just a matter of hitting the farmer’s market at the right time of year and stocking up when the getting’s good.